The blouse pattern which has become every green since days is Elbow length blouse pattern and if we observe in this present fashion era irrespective of the age and size of the body is “Elbow length sleeve blouse and our celebrities are the classic example. Trending brides & Celebrities choice on kanjeevaram sarees is Elbow length sleeve blouse pattern. 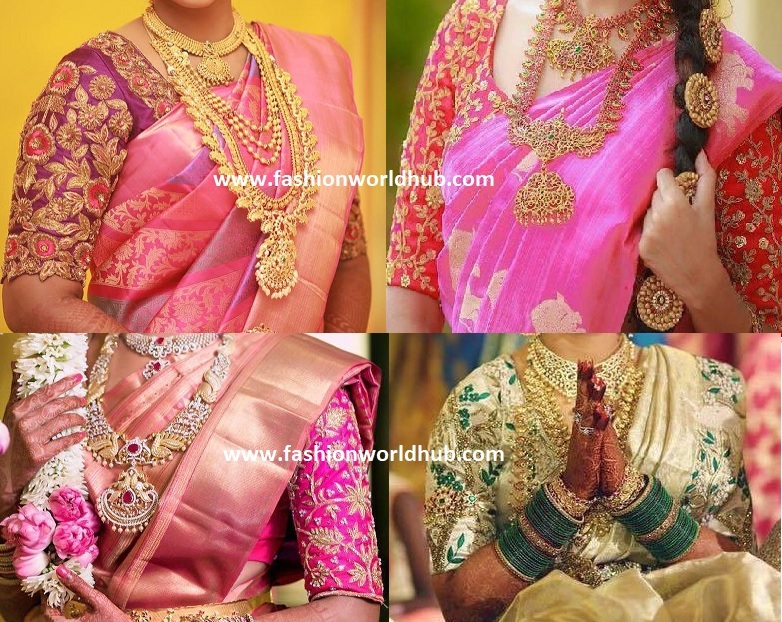 These blouses do the justice on the pattu sarees. We keep seeing that when you have a big border on the saree and we don’t feel like wasting the heavy big border and the best option is make those border as sleeves and this pattern is one of the major hit on Pattu sarees. It is so true, that what goes, does come back in some form or the other. Blouses with sleeves till your elbow fold were in fashion in 90’s. It has revived back in present fashion trend with a lot more options embedded in the fashion world. This has re-emerged with a sleeve full of embellishments or embroidery. Such add-ons and accessories make a simple blouse a masterpiece to be cherished for a lifetime. Blouse pattern or designs is one of the most essential factor in breaking or making the look of your outfit, therefore elbow sleeves in a blouse play a safer role for you to try. It is really important to select a suitable saree, which suits the blouse design, and pattern and compliments your attire and of course your personality. 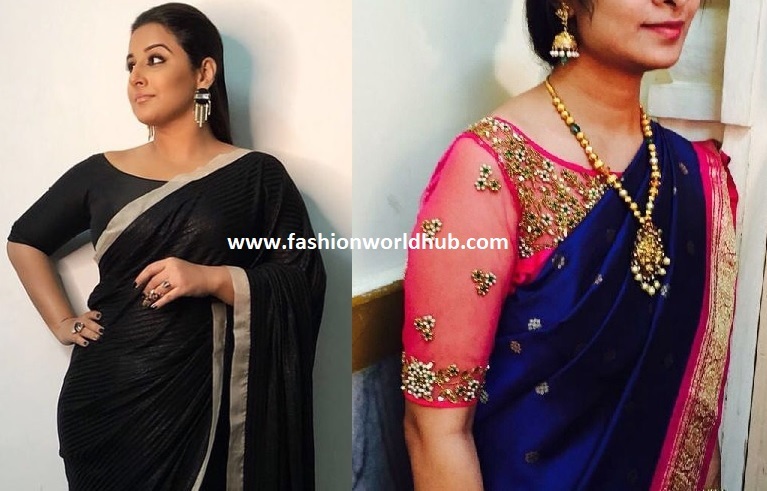 There are many reasons why to choose elbow length sleeve with your saree, let me point out a few to convince you to try out this historical look. Stylish look :- Well if we go back to 80’s it is the elbow length sleeve which was the only option that was opted at that time and now that old fashion has become more popular in the present trend . As per the trend report understand that this elbow length sleeve blouse style is one of the major hit on the kanjeevaram sarees that has big border. Let the saree be a chiffon , georgette, shibori saree these elbow length blouses will look good and stylish. With a twist of ruffle or border at the end of the sleeves will make your blouse a statement look. Best Option for Bulky arms :- If you have bulky arms these elbow length sleeves helps us to look slimmer. As every woman prefers to wear an elbow sleeve length is it hides all the flaws and flab’s on your fat arms and gives them a slimmer shape. This pattern blouses will suit irrespective of the body size and shape. Add some embroidery work or gottapatti border on the sleeves to change the complete look of the blouse. Comfortable :- The best part of these blouses are they are very comfortable to wear compared to other blouses with full sleeves are very close and sleeveless does not suit everybody types. So, an elbow sleeve basically suits all, irrespective of the type of flesh you carry in your arms. One of the main reason is it goes well when paired up with any saree material be it chiffon, georgette, silk or cotton. Luxury for Heavy designs on sleeves :- Another major reason to wear an elbow sleeve blouse is the amount of work or embroidery that gets to go on an elbow length is more than any other part in a blouse and due to this, it adds beauty to the whole blouse. A Kanjivaram silk saree needs a blouse full of work, be it sequins, embroidery or pearl work. The length of the sleeve, which carries the required amount of work to suit your saree and give you a traditional and royal appeal. Go ahead and get a plain or an embellished elbow sleeved blouse to give a new look to the sarees lying in the wardrobe for ages. 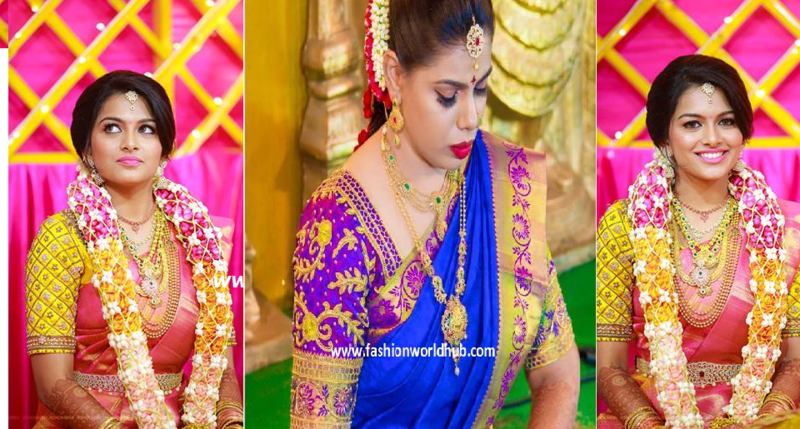 A cost-effective way to enhance your beauty with a safe fashionable option is a decent alternative to flaunt with any saree with poise and glamour.